Before sunrise on February 1, Venus and Jupiter will appear low in the southeastern sky, as seen from midnorthern latitudes. 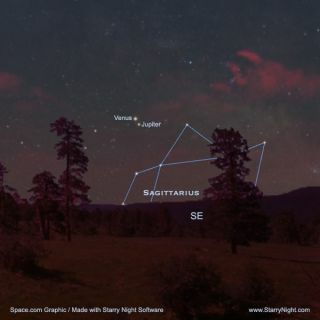 The most spectacular celestial sights over the next coupleof weeks are reserved for the early morning sky. Two bright planets willconverge, then be joined by the moon. Kenneth L. Franklin (1923-2007), the former Chairman andChief Astronomer at New York's Hayden Planetarium, would often make referenceto our "dynamic and ever-changing sky." Such an eloquent description certainly fits our currentmorning sky, for these final days of January and the first days of February willbe an exceptional time for predawn sky watchers with a beautiful pairing of thetwo brightest planets, Venusand Jupiter.They will appear closest together in the dawn sky of Friday, Feb. 1, and a fewmornings later, the waning crescent moon will later drop by to join them. For the past several months, dazzling Venus has been prominentin our morning sky. And about a week ago, brilliant Jupiter also began to emergefrom out of the glare of the Sun. The two planets are currently rising out of theeast-southeast horizon about two hours before sunrise. From now through the end of January, the gap between the twowill noticeably close, until on Feb. 1 they'll be separated by just overone-half degree, which is roughly the apparent width of the moon (The width ofyour fist, held at arm's length roughly corresponds to 10 degrees). Jupiterwill shine brilliantly at magnitude -1.9, yet it will appear only 1/7 as brightas Venus, which will gleam at magnitude -4.0. Together they will make for a spectacular "doubleplanet" low in the dawn twilight. In the mornings thereafter they willappear to slowly separate, but before they have a chance to get too far apartthe moon will join the picture. At last quarter (half) phase on Jan. 30, the moon will standalone, high toward the south at sunrise. But with each passing morning, as itwanes to a slender crescent, it will shift toward the east, ultimately into thesame region of the sky as our two planets. Early on Sunday morning, Feb. 3, the moon will sit well offto the west (right) of the planets. On the following morning, Monday, Feb. 4,the show will reach its peak when, about 45 minutes before sunrise, Venus,Jupiter and the moon — the three brightest objects of the night sky — will forma striking isosceles triangle, with the two planets 3 degrees apart and the moonmarking the vertex of the triangle just over 5 degrees below the "dynamicduo." Imagine the astrologicalsignificance that the ancients might have ascribed to a celestial summitmeeting such as this! You might want to check your southeast horizon in advance tomake sure that there are no tall trees or buildings that might obstruct yourview of the moon which will be sitting very low to the horizon. Like a painting, this celestial tableau might, at firstglance may appear rather flat and one-dimensional. But by gazing at this scenelong enough, our minds can perhaps picture these objects strung out across thesolar system, along our line of sight as they really are. Beyond our moon — figuratively a stone's throw away at247,000 miles (397,000 kilometers) — we first reach Venus, about 510 timesfarther out, or 126 million miles (203 million kilometers) from Earth. The lessergem flanking Venus — Jupiter, largest of all the planets — is nearly 4 and ahalf times more distant than Venus at a distance of 560 million miles (901million kilometers). Generally speaking, at least for the immediate future,conjunctions between Venus and Jupiter will come in pairs. The firstconjunction takes place in the morning sky, followed about 10 months later byanother in the evening sky. Then, after about two and a half years, Venus andJupiter are again in conjunction, again in the morning sky. When Venus and Jupiter next get together, it will be in theevening sky late next fall, on Dec. 1. After that, we'll have to wait until May2011 (morning sky) and Mar. 2012 (evening sky) for the next set ofVenus-Jupiter conjunctions.